When Mommy leaves she always knowsto give me kisses from head to toe. Kisses to save and use all day,whenever I need one and Mommy's away... Pocket Kisses is the perfect book for kids missing Mom while she's away. Each page celebrates the special pocket kisses Mommy leaves behind - a boo-boo kiss, snack-time kiss, bedtime kiss and more - all revealed beneath each of the 7 sturdy lift-the-flaps. 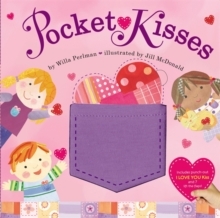 There's also a fabric pocket on the front cover and a special keepsake 'pocket kiss' that kids can punch out and hold on to, reminding them that Mommy's love is always with them! Pages: 16 pages, Integrated: 14, Colour Illus.